Our favorite nestcam this month is the ridiculously adorable Bermuda Cahow chick on Nonsuch Island. He’s so fluffy and tiny that every movement and especially wing flapping becomes an experience! And don’t miss the parental visits to feed and preen him and fluff his nesting materials. Unbearably cute! Fraser Point Bald Eagles – all 3 eggs hatched — watch the new chicks! Ospreys on the nest incubating eggs in Savannah, GA. 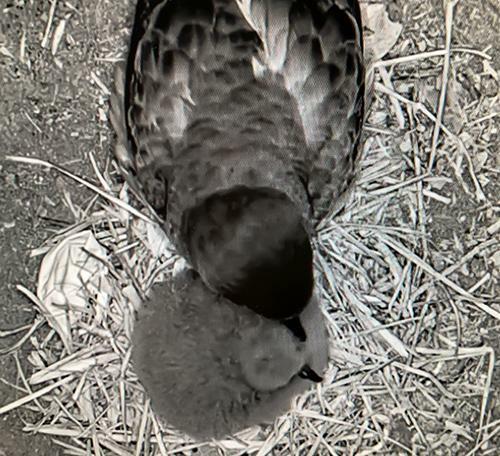 Barred Owls in Indiana are incubating eggs in their nestbox. Great watching the male feed the female! Sauces Bald Eagles in Santa Cruz, CA have had 2 broken eggs. The 3rd egg was laid in mid February and they are taking extra care of it. Panama Canopy Lodge fruit cam – We can’t get enough of these birds coming to a fruit feeder!